My husband bought a new bicycle so that he can ride it to the office. He always wanted to buy one, because it takes about 45 mins to the office by foot, and also, it could be save money and time. Even when he goes to the office by car, often he is caught by the traffic jam an wasting time and petrol. Anyway, my husband's coworker told us that more and more people start riding bicycles because of economic crisis and high price of petrol. I've heard that price of a bicycle is doubled or even more in the last 3 years here in Zagreb. It might increases the number of stolen bicycles in Zagreb. I think it is not only the problem in Zagreb, but all European countries share it, but bicycles thefts are very serious problem. 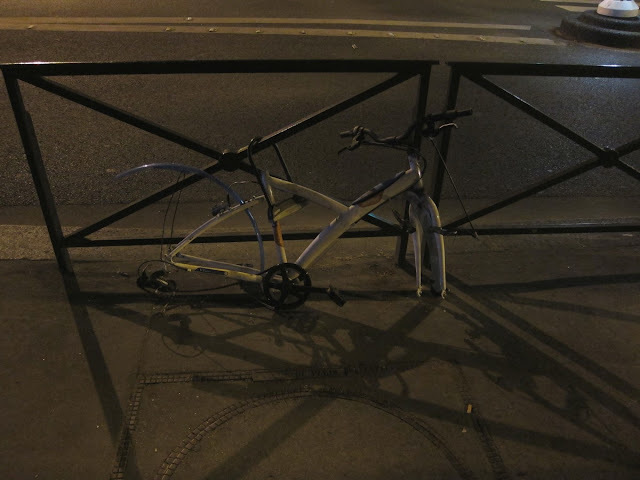 I've even heard about a story that a person locked his bike between the main frame and wheel and went to ATM, and in a few minutes when he looked away, someone took his bicycle. The photo above is the bicycle I found in Paris. So, to avoid our bicycle be stolen, we keep the new bicycle inside our apartment. The situation is very different from Japan, well, at least from my town and around. There are of course bike thefts. But, most cases, a thief steel a bike which is not locked, and the purpose of steeling is not to sell it but to get a quick ride to his destination and then just leave the bike there. So, when a bicycle is stolen, we usually report it to a local police and they will find it in a month with high chances. I think compared to Holland and Denmark or other European countries, Zagreb needs to improve the bicycle roads a bit more. Well, compared to Japan, Zagreb is better, because in my town and around, we don't have it yet (I think we still don't...). Anyway, when you ride a bicycle in Zagreb, watch cars around you carefully. I found out that many Croatian drivers turns without turning the indicator or turns the indicator the moment when they turn. Which actually surprised me because the driving habits are bit different from Japan.